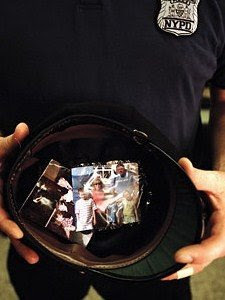 Sunday's New York Times had a nice little story by Niko Koppel about pictures and other mementos that police officer keep in their hats. The hat-wearing regulation isn't as strictly enforced in Baltimore as it is in New York City. But I like wearing hats. Young police officers officers will quickly hear that hats, especially when you're on foot, are a great place to keep things (like ticket books). I tried that. It didn't work. I sweat too much. With any heat, anything in my hat--pictures, paperwork, ham sandwiches--they would all be soaked and nasty before my shift was done.